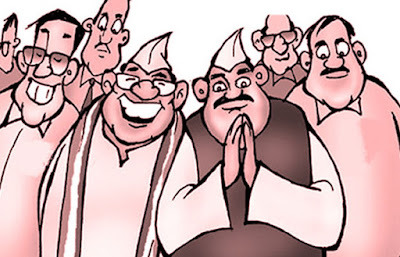 Indian politics is a jamboree of councils and assemblies, of multiple parties both national and regional, of politicians young, middle aged and even nonagerian (90 year olds). It can get overwhelming for a newbie to understand how the Parliament works, how the elections are conducted and how the Governments are formed or even brought down. The game of power is rather intriguing and while there may not be as much bloodshed in the name of politics as in the medieval age, but there are definitely enough Machiavellis to be wary of. In light of the recent Cabinet expansions announced by our Prime Minister, Narendra Modi, let me take you through a beginner’s journey into the Frenzy called Indian Politics. Fasten your seat belts because this ride could be kind of turbulent! Once upon a time a country called India became independent and decided to move ahead with a constitution that believed in socialism. Remember, then we used to be rather friendly with USSR (Union of Soviet Socialist Republics) and we wanted to follow their style of economic system. Well that country doesn’t exist anymore – it split into 15 countries, ummm..not all are friendly with us. And along the way we gradually abandoned socialism and adopted an American baby called Capitalism. So is this politics? No, not really. But our economic system defines the manifesto of the various political parties that battle it out during elections (National or State), so it is important. Anyway the country’s journey continues rather simplistically. It decides to adopt everything that is British, the democratic system, the bicameral legislature, the election commission, and while they have a rubber stamp Queen, we have one in our president. How convenient! So let’s talk about our Parliament and how it functions. The Parliament of India is the supreme legislative body and has two houses for its legislative members. The Upper House or the Council of States is called the Rajya Sabha, and the Lower House or House of the People is called Lok Sabha. There are 543 members in the Lok Sabha, all of whom are directly elected by the citizens of our country. Soon NRIs will also be able to vote from their respective new countries of residence. The Rajya Sabha on the other hand has strength of 245 members only and can expand to only 250. 233 members have to be selected from States and Union Territories (based on their population strength), and 12 are nominated by the President from the expertise of different fields of science, culture, art and history. At the State level, there are 7 states, namely Jammu and Kashmir, Andhra Pradesh, Telangana, Karnataka, Maharashtra, Bihar and Uttar Pradesh which have bicameral legislature. These states are the most populous ones and hence have an Upper House called Vidhan Parishad and a lower House called Vidhan Sabha. The remaining States and UTs have unicameral legislature, i.e. there’s only the Vidhan Sabha. Elections are held separately for the Central government and the different State and UT governments. Although, now there are talks of cutting costs and preventing loss of man hours by holding elections across all SUTs and the center simultaneously. Now that I have confused you thoroughly, my suggestion is go ahead and find out how many seats does BJP have in the Lok Sabha, in the Rajya Sabha and how many states is it present in and has formed the state government. Not such a tall task, go ahead and plunge into the depth of craziness! For more details about our political system, keep watching this space.